Alright, there was a visible lack of articles during the last week or so on this blog. The reason is simple - the STI looks to be headed to another 3000 level resistance and the uptrend is dwindling. Instead of getting caught with the already-pretty-old rally, I have been busy winding down on the remaining opened positions that I have been monitoring (You can find the list at the "Historical Stock Calls" section). I must qualify here that I am just lowering exposure in an uncertain market and not taking an opposite view to this rally scenario. STI to convincingly break 3000 on news of a combined China stimulus + US Fed QE3 packages. On both technical and fundamental analysis fronts, I am quietly confident of the STI holding at this level for a considerable period of time, say 2-3 weeks, which is the 2nd option of my list of possible scenarios. the STI/Singapore stock exchange is undoubtedly one of the strongest performing market in the region and has remarkedly appreciated in the last 2 months and even retested the 3000 level set in Feb early this year whereas the HSI has failed to reach its similar highs. Bad news have been sweeping in since start of 2nd half of the year with China and US tanking. So, the outlook is not as rosy as it was in the first half of the year but hey, why are stock markets still rallying? Simply because of the optimism that governments are going to act soon and see results in the next 6 months (money to flow into the system). So more bad news? No worries. Europe? Spain is out in the open for scrutiny while Greece fixes themselves. Italy and Ireland have been doing comfortably well in their own ability. It has already come to a point that the European leaders for once know how badly people are looking at their mess and how they ought to band together, probably, for the one and only time, to get everybody out. It's an IPO season isn't it? Companies are now rushing out their IPOs to catch on this improved investor sentiment to lure the mass retail and institutional market investors back into equities. That speaks a lot about how companies are trying to expand in this condition and their long term view of the market conditions. Technically, the STI has done a fabulous job over the last 5-6 weeks. It is most technically sound to suggest that the STI will reach a consolidating position by referring to the periods highlighted by the 2 green bubbles. When the 20d MA does cross the 100d (the 20d MA already crossed the other 50/200d MAs) finally in April 2011, it began to consolidate at its 3100 level. MACD was looking to cross down under as is with the set up in this period. 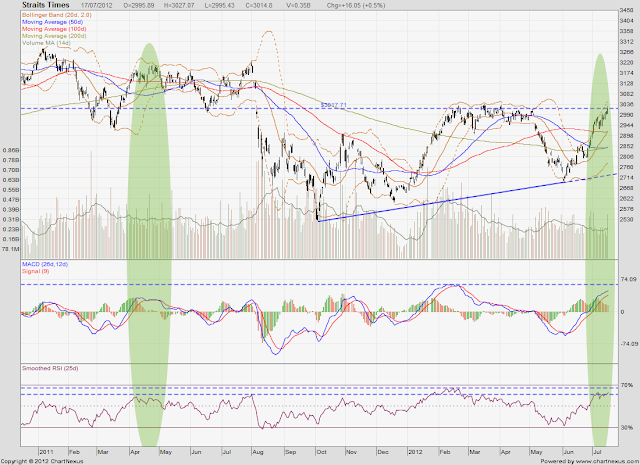 Similarly, RSI has seemed to be unable to break the levels and a M occured. MACD - Positive momentum is on the wane. Possibly peaking out in the next 2-3 days before a cross under of its signal line. RSI (25d) - Retested 65% level but unable to break through. At article-published-time, the RSI has reduced below 65% again. 20d MA - the 20d MA is above 50/100/200d MA lines. Major Resistance - 3000 level still seems like a very strong psychological level. Volume - A surge in volume occurred yesterday (17/7) which saw the STI consolidate its position at 3020.